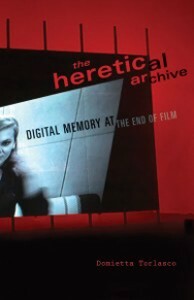 On Friday, December 6 at 7 p.m. Counterpath host filmmaker and scholar Domietta Torlasco for a talk and presentation from her recently released book The Heretical Archive: Digital Memory at the End of Film (University of Minnesota Press, 2013). Torlasco presented her work— “part philosophical reflection, part manifesto”—and also screened her short film Antigone’s Noir. Antigone’s Noir (U.S., 2008-09, 25 min., digital video) is composed of three interlocked episodes (Lenox, Effie and Judy Barton) that look back at classic film noir. Each episode envisions — with the help of scenes shot in contemporary settings, documentary photographs and footage from public archives — what might have happened before a film started or after it ended. Relationships between protagonists and marginal figures, between male and female characters are shifted, creating irreverent configurations of memory and desire that reach beyond the archetypes of the femme fatale and the innocent woman. Torlasco’s book, The Heretical Archive, examines the relationship between memory and creation in contemporary films and installations that use digital technology while simultaneously appropriating analog materials. Domietta Torlasco argues that these digital and multimedia artworks radically transform our memory of cinema and our understanding of the archive. Connecting psychoanlysis, phenomenology, and feminist theory in innovative ways, Torlasco analyzes cutting-edge digital works that engage with the past of European cinema and visual culture. She claims that if the archives of psychoanlaysis and cinema have long privileged the lineage that runs from Oedipus to Freud, the archives of the digital age—the “heretical archive”—can help us imagine an unruly, porous, multifaceted legacy, one in which marginal figures return to speak of lost life as much as of life that demands to be lived. Domietta Torlasco is associate professor of French and Italian and comparative literary studies at Northwestern University. She is the author of The Time of the Crime: Phenomenology, Psychoanalysis, Italian Film.